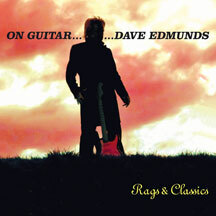 Dave Edmunds produces his first ever completely Instrumental album including 7 totally brand new recordings! Dave Edmunds produces his first ever completely Instrumental album. The album features classic pop songs favored by Dave for their arrangements and reinterpreted by Dave as guitar pieces plus traditional picking tunes arranged by Dave, influenced by his favourite guitar pickers such as Chet Atkins, Merle Travis, Jerry Reed. Like Jeff Beck, he can make his guitar sing and cry without the aid of pesky vocals. The Welsh twangmeister lets his music do the talking... It might drop your jaw.